Very little is known about Damien; it is not clear even whether he was Italian or French, or where he was educated. He had a long career as a Royal alchemist and sidekick, but he is known to the world as the man who claimed he could fly to France from Stirling castle, and so jumped from the crag with wings made of wood covered with feathers strapped onto his arms. Of course he fell down into a dungheap and broke his leg, but the only evidence we have for that is the potentially malicious story telling of Bishop Lesley and the disgruntled poet Dunbar, neither of whom liked the man. How much their dislike was due to Damien’s character or behaviour, and how much due to the fact that he managed to stay in Royal favour for years on end is unclear. An early examination of Damien’s career is found in The Proceedings of the Society of Antiquaries of Scotland, April 12, 1875, where John Small wrote: “… and continued during the rest of his reign to expend considerable sums of money in attempts to make “Quinta Essentia”, which should convert other metals into pure gold, heal all diseases, ….” Thus we see it stated plainly that Damien was unsuccessful and that quintessences, i.e. fifth essences, a fifth element that was thought to be incorruptible, are a form of the philosophers’ stone. This is indeed the conflation made by the group of English alchemists and medicinars who were attempting to cure King Henry VI of England of his madness, some 45 years earlier. I on the other hand now think it clear that Damien was successful in making the quintessence and in his career, by the standards of the day. Not only did he maintain himself at the court at the cost to the King, from 1501 onwards, with a short break on the continent, he was even found, after the death of the King at Flodden, to be involved in looking at the mine of Crawford Moor, presumably with a view to getting more precious metals from it. James IV, as a renaissance king of many virtues, had a great interest in medicine and related topics and is known to have paid someone to allow him to extract teeth from him. At this time medicine and alchemy were related by virtue of medicines made by distillation, which by 1500 were commonplace across Europe, and utilised the practises of alchemists allied to medieval herbal medicine. Many of the cures were based on spirits of wine, often mixed with herbs and other plants, if not some metals or inorganic substances. That James should have had an alchemist at court is no surprise, and John Damien was installed at one of James’ favourite residences, Stirling castle, where he had furnaces built for his work. Unfortunately as far as I know nothing survives of the furnaces. This brings to mind the idea of a drunken alchemist helping others get drunk, by making high proof beverages, of the sort which it is now illegal to make. However what Holmyard overlooks but was noticed by Small is that Damien was very likely aware of an alchemical text called “The Book of the Quintessence”, by John of Rupescissa, which was very popular in 14 – 15th century Europe. It was translated into English in the 1460’s or so, and a copy is available, published as the Early English Text society Original series number 16. 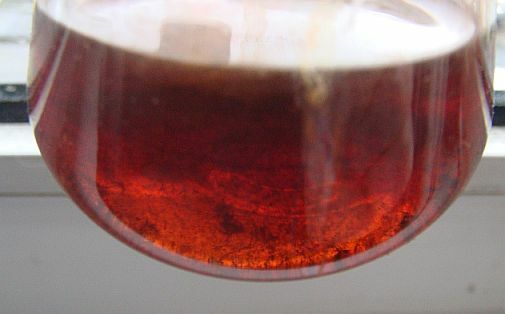 This describes the use of seven times distilled wine to make the quintessence by means of re-circulation of the high proof alcohol for a long period, as well as the extraction of quintessences of gold and of antimony. Page 183, ‘february 1505-6, 28 shillings of aqua vite to the quinta essentia’. Page 187, to ‘Robert Herwort for aqua vitae taken from him, 14s’. Immediately we see that Damien was using quite a lot of aqua vitae, that is, spirits made from wine or ale. But that was not all he was up to. The Soc Ant Scot. paper says that one of the earliest mentions is in March 1501-2, of “4 hary nobles being sent to the Leich for the multiply”, the leich being Damien. Yet all this proves is that his first appearance is as a multiplier of precious metals, someone attempting to make more gold from a little of it. Not making the quintessence. This first makes an appearance in 1502-3, with the purchase of quicksilver for the making of quintessence. Mercury is actually used in “The book of the Quintessence” for the making of the quintessence of gold, by making an amalgam of mercury and gold which is then distilled and sundry other operations are carried out. All the recipes in the book are for medicines, so a medicine made of gold, the perfect incorruptible metal would be a valuable thing indeed and at the time it was entirely respectable to make and use such a substance. More connections are found in later years, such as in 1507-8 we find sal ammoniac being purchased for the quintessence. It is used in “The book of the Quintessence” to help dissolve the gold when separating it from silver. So we have a further correlation between Damien’s work and “The Book of the Quintessence”. Interestingly, in 1503, “pottis of lame” are purchased, and later on for coals for quinta essencia, i.e. for heating the furnace, and also charcoal for the same. Pottis of lame means earthenware pottery, according to the Dictionary of the Scottish language, and is used several times around 1500. Unfortunately that does not say anything about what shape they were, but it is likely they were small pots for holding ingredients and finished medicines. The actual distillation was done using a silver alembic, also purchased, and some glass flasks. Or perhaps the flasks or pots were cucurbits for carrying out distillation, but we simply cannot tell from the scanty evidence and lack of relevant finds. Annoyingly I can’t find any mention of the specific apparatus, called a Pelican, for making quintessence from aqua vitae, but the accounts, such as in volume four covering 1507-1513, list a huge number of other things, some of which have already been mentioned, and others being caldrons, pitchers, wood and coles, cakes of glass and urinals and great flasks. The last ones likely include the actual pelican; the purchase was made in 1507-8, page 94 of the ALHT, and cost 28 shillings for 11 ‘urynales’ and two great ‘flacatis’, which frankly isn’t a lot, given that it could cost the same amount to pay for someone to travel to Edinburgh, or five shillings to two fishermen for a pike brought to the king. They were likely imported, since I’ve never read about the manufacture of glass objects in Scotland at this time. So my conclusion is that, contrary to the idea that many have, Damien was a successful alchemist, through his manufacture of the quintessence and probably several quintessence based drugs and cures for the Scottish court. Someone who was expert at medical work and production of the intoxicating quintessence (About which I have a theory requiring some experimentation) would certainly be worth having and retaining at court. Although he first appears as a mere multiplier, perhaps a charlatan, after this failure he kept on making the quintessences for the King and his court, bringing modern medicine to Scotland and thus ensuring his successful career. Unlike many alchemists he apparently knew when to quit.